If you’re hoping to get fans/friends to interact with you more on Facebook (and you should be! ), posting photos is the best way to go. The worst? Posting links. That’s something for small business owners to think about in light of Facebook’s Edgerank algorithm. Two recent studies came to this same conclusion about photos, link and other types of content on Facebook. The first study that I’ll mention comes from Web Liquid, a digital marketing company. They studied 16 brands with 3.5 million combined Facebook fans. More than 1,500 brand posts were analyzed between March and May, 2011. Photos and videos both drew more than double the interaction that links did. Web Liquid also studied the reach of each type of content and found that the top two were flipped: videos generated the most reach (i.e., they spread further to friends of fans, etc.) and photos generated the second-most reach. You can download the report from Web Liquid’s website; name and email address are required. Earlier this year, Momentus Media did a somewhat similar study that analyzed 20,000 Facebook business/brand pages and analyzed tens/hundreds of thousands of Facebook posts. 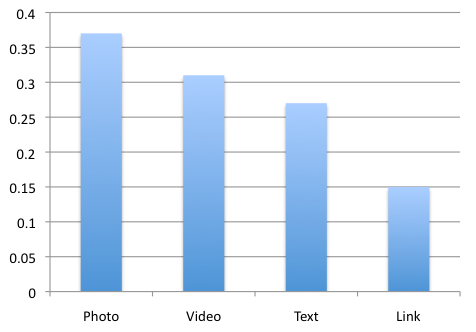 Their findings were similar to what you’ve seen above: Photos get the most interaction, while links get the least. 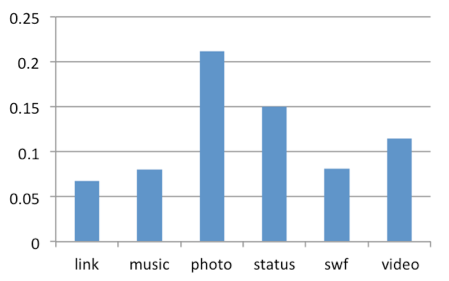 This study differs a bit in the middle — it found that text/status updates attracted more interaction than videos. This study offers a lot more data about business/brand activity on Facebook. You can download it from Momentus Media’s website. The reason all of this matters is EdgeRank. That’s the name of the algorithm that Facebook uses to determine what content shows up in its users’ Newsfeed. There’s a great EdgeRank guide on eConsultancy, but the Cliffs Notes version is this: The more a user interacts with your content, the more your future content will continue to show in his/her Newsfeed. There was a study earlier this year that showed about 5% of Facebooks fans ever see posts to Facebook Pages. Yikes! That’s because of EdgeRank. So, if you want your fans to see more of your content, keep in mind the types of content that they interact with more often. If they’re not interacting with you on Facebook, you might be wasting a lot of time. Thanks for the info. That’s really helpful but do you have suggestions for how businesses can appropeately increase interaction? Photos seem unprofessional for a law firm. Thoughts? Facebook has said from day 1 they don’t want people to push via 3rd parties. Images share well, but only those uploaded directly via app or web. Instagr.am, Twitter tools, and the rest are all punished by EdgeRank. That’s also why external links are penalized and don’t get as much visibility in your newsfeed. Pretty genius move, and most have no idea it’s even going on. Thanks very much, Jim — appreciate it. Now I understand why there are so many photos appearing on facebook of different motivational quotes and things. Links are so much easier but now I will have to find a way to share photos and videos instead. But the point is it is pointless if there is no link directed from FaceBook page! Is it generate traffic from Facebook that the ultimate aim? « Where Do People Look When Searching Google Maps?